Depositions are a discovery tool often used by lawyers in order to gather information in a divorce proceeding. Family law attorneys in San Diego may take the deposition of a party to the action or any other third party who may have pertinent information. A deposition is the oral exchange of questions and answers between an attorney and the deponent. If the deponent wishes to have an attorney present to represent him or her, the attorney may make objections to the questions asked during the deposition. 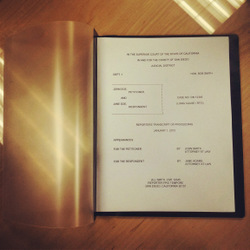 Receiving a notice that your deposition will be taken in a divorce proceeding can be daunting. However, understanding the process can be helpful in alleviating any nerves that may arise. Attorneys decide to take depositions in family law for a number of reasons. For example, depositions allow the attorney to gather a significant amount of information in a short period of time. Other forms of discovery permitted in San Diego courts allow for a minimum of thirty days before the responding party is required to give his or her answer. In addition, if the lawyer wishes to ask a follow up question, he or she will be required to send a new set of questions to the responding party and wait an additional thirty days for a response. Depositions can also be a great tool in a divorce case if a lawyer wants to determine how a witness will appear in court. In San Diego, the lawyer will have the opportunity to ask the witness the same questions he or she plans to ask at a hearing or trial and to hear the witness’s answers. Prior to the commencement of a deposition, the deponent is “sworn in”. Once the deponent is sworn in, he or she is “under oath” and obligated to give truthful answers or face potential perjury charges. If spousal support (commonly referred to as alimony) is an issue in a San Diego divorce case, the income of both parties will be highly relevant. If one party owns his or her own business, it may be difficult to determine his or her income. Much of the information regarding the income of the business owning spouse will come from the testimony the attorney has taken. Therefore it is important for the business owner to appear credible in court. If an attorney takes the business owner’s deposition to gather information on his or her income, the attorney may use all of the answers provided at a hearing or trial on spousal support. If the business owner gives contradicting information at the deposition or in court, he or she will lack credibility. In family law, depositions can be a great opportunity for divorce lawyers to bring both spouses together for settlement negotiations. Once all the pertinent information regarding assets, debts, and income is gathered by both parties, they may be in a position to settle the case.